Figure 6-20.Type 1 mechanical seal. Home > Construction Training Manuals > Utilitiesman Volume 01 > Figure 6-20.Type 1 Mechanical Seal. date stamped on the package to help you determine the shelf life of the packing. If a package has become unsealed, reseal it. Better yet, ensure the packing is used before its expiration date. Packing requires frequent inspection and adjustment, particularly while the pump is in operation. The gland nuts must be adjusted with care, so ail the packing is compressed evenly and equally around the joint. If not, excessive and uneven wear of the packing can result, and the rotating or sliding shaft could become scored or grooved. When a pump is first started, lubrication of the packing may be relatively poor. Because of initial friction, the packing may heat up and expand, thereby compressing itself around the joint and further reducing lubrication or leakage. Merely loosening or backing off the gland nuts is not always the best solution, because the liquid pressure in the pump can force the complete set of packing to move outward in the stuffing box. In this instance, the pump has to be shut down and the stuffing box allowed to cool. Several restarts may be necessary before the stuffing box runs cool. Additional packing procedures are too extensive to be covered here. The primary purpose of this discussion of packing is to alert you to the importance of this pump component. It has been said that the proper inspection, adjustment, and upkeep of the packing are the most abused aspects of pump operation and maintenance. Another important aspect of pump operation and maintenance is the understanding of mechanical seals. Mechanical seals are rapidly replacing conventional packing as the means of controlling leakage on centrifugal pumps. Pumps fitted with mechanical seals eliminate excessive stuffing box leakage that results in pump and motor bearing failures and motor winding failures. Mechanical seals are ideal for pumps operating in closed systems, such as air-conditioning and chilled water systems. Figure 6-20. 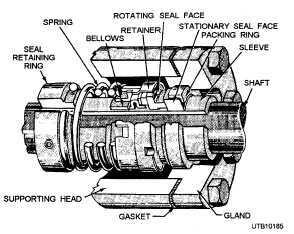 - Type 1 mechanical seal. depends upon the service of the pump. Most water service pumps use a carbon material for the seal faces. When the seals wear out, they are replaced. New seals should not be touched on the sealing face because body acid and grease cause the seal face to pit prematurely and deteriorate. Mechanical seals should be replaced whenever the seal is removed for any reason or whenever the leakage rate exceeds 5 drops per minute. Mechanical seals are positioned on the shaft by means of stub or step sleeves. Mechanical seals should not be positioned by the use of setscrews. Shaft sleeves are chamfered on outboard ends to provide ease of mechanical seal mounting. Mechanical seals ensure that positive liquid pressure is always supplied to the seal faces and that the liquid circulates well at the seal faces to minimize the deposit of foreign matter on the seal parts. Figure 6-21. 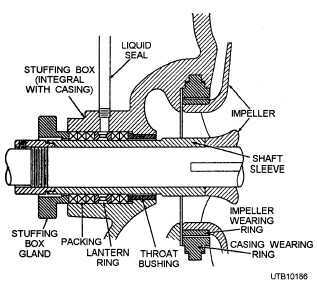 - Stuffing box on centrifugal pump.